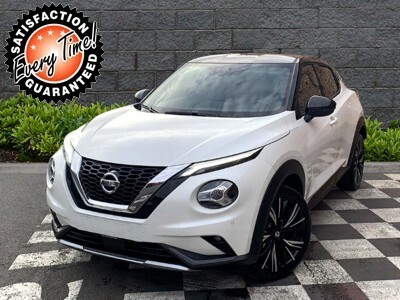 This Nissan Juke is available in Silver, Black, White, Red, Blue other colours and lease options, subject to availability and includes a warranty. This Nissan Juke Diesel Hatchback 1.5 dCi Tekna 5dr deal is suitable for business and personal use and comes in various colours, specifications and options. » Contact us for more Nissan Deals like this. These top quality are offered with various petrol or diesel, automatic or manual engines. Apply for a free quote and we'll provide you with the cheapest possible price. This representative example is based on a personal contract purchase agreement. This is a 0% deposit nearly new vehicle and No Deposit is required, then monthly payments are £185.87 x 48 exc. Vat. At the end of the agreement there will be a lump sum outstanding which is commonly referred to as the balloon payment. You will have several options depending on whether or not you want to own the car or change it. You can pay the outstanding balance, either in cash or by re-financing the balloon payment, hand the car back, or use your vehicle as a part-exchange for another car. If you wish to pay a deposit and reduce the monthly payments, please contact us and we can provide you with a free quote suited to your needs. We provide unbeatable car leasing deals to customers with good, poor or even bad credit history profiles. We compare over 350 car leasing brokers so you receive the best available deals from the UK. When you submit just one application, we compare over 90 lending options, providing you with the lowest possible rates. We offer flexible motoring, from contract hire to PCP leasing which allows you to drive a newer model car every 2, 3, 4 or 5 years. You have the option to add extra named drivers onto the car lease finance agreement at no extra cost. 9.8 out of 10 customers highly recommend our services.